Southern California Psunami 10u snatched the lead late in the game in a 7-5 victory over Santa Ana Bomb Squad on Sunday. Southern California Psunami 10u trailed 4-3 in the bottom of the sixth inning when Sydney R doubled on the first pitch of the at bat, scoring two runs. Santa Ana Bomb Squad scored three runs in the fourth inning, but Southern California Psunami 10u still managed to pull out the victory. The big inning for Santa Ana Bomb Squad came thanks to a single by Viviana and a groundout by Naveah. Southern California Psunami 10u got on the board in the first inning. In the top of the fourth inning, Santa Ana Bomb Squad tied things up at three. Viviana singled on a 1-0 count, scoring two runs. Taylor M toed the rubber for Southern California Psunami 10u. She lasted seven innings, allowing nine hits and five runs while striking out five. Mariah got the start for Santa Ana Bomb Squad. She lasted two innings, allowing four hits and five runs while striking out one and walking one. Naveah threw four innings in relief. 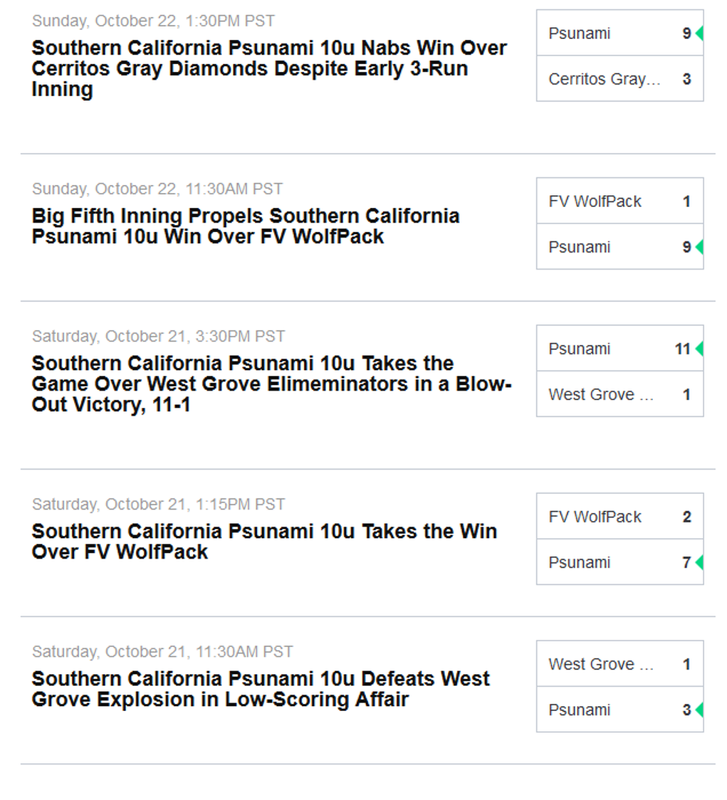 Southern California Psunami 10u racked up five hits in the game. Sydney and Colette F all had multiple hits for Southern California Psunami 10u. Colette and Sydney all had two hits to lead Southern California Psunami 10u. Southern California Psunami 10u stole six bases during the game as two players stole more than one. Cassie led the way with two. Mariah went 2-for-3 at the plate to lead Santa Ana Bomb Squad in hits.